NEW YORK (JTA) — “This Jew says no to white nationalism,” one sign read. “Silence is akin to consent,” another said, quoting the Talmud. The signs, along with chants like “Donald Trump, it’s your fault; Stephen Bannon, oy gevalt!” were not only directed against Bannon, the president-elect’s choice for chief strategist. As hundreds of Jewish protesters marched up Manhattan’s East Side on Nov. 20, they also targeted the Zionist Organization of America, the pro-settlement group that had advertised Bannon’s anticipated presence at its gala that night. Bannon never showed up at the dinner, but to these protesters that wasn’t the point. 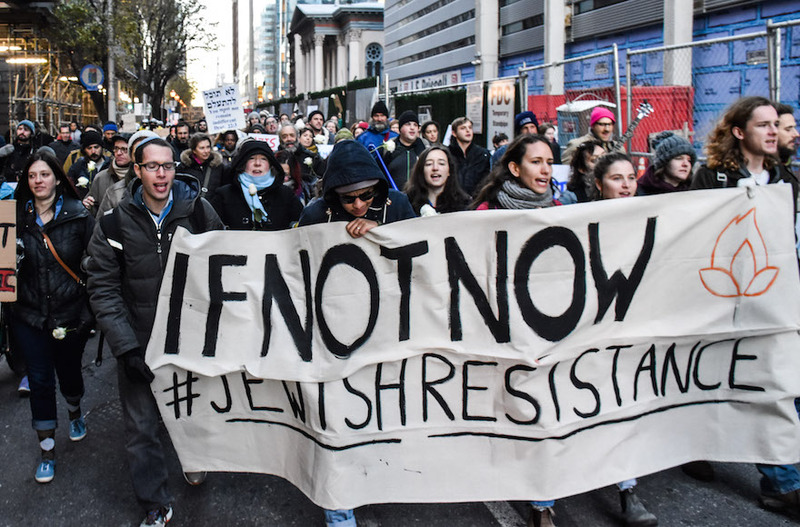 The group that organized the protest, IfNotNow, says the real issue is a disconnect between Jewish institutions and the values of young Jews. Legacy Jewish organizations, IfNotNow activists charge, are so focused on supporting Israeli government policy that they are willing to dismiss other Jewish concerns — like bigotry on Bannon’s former website, Breitbart News. The group takes its name from “If not now, when?,” the end of a statement by Hillel, a first-century rabbi. Founded in the summer of 2014 to organize young Jews opposed to Israel’s war in Gaza, IfNotNow has since evolved into an activist community steeped both in left-wing protest and Jewish tradition. It rails against Israel’s control of the West Bank, the incoming Trump administration and Jewish organizations it accuses of supporting both those things. Trump’s election has given the group a boost. In November, IfNotNow organized simultaneous demonstrations against Trump and Bannon in 30 cities — dubbed the Day of Jewish Resistance. On Wednesday, the group expects 200 people to attend its protest of a Hanukkah party hosted by the Conference of Presidents of Major American Jewish Organizations and the Embassy of Azerbaijan at Trump International Hotel in Washington, D.C.
Lieberman said nearly 3,000 people have participated in IfNotNow’s recent anti-Trump demonstrations, and 650 have attended activist training sessions the group is holding across the country. Ending “American Jewish support for the occupation” is the group’s primary goal, although it is light on ideological specifics: IfNotNow takes no position on Zionism, the two-state solution or the movement to boycott, divest from and sanction Israel known as BDS. The neutral stances lead some mainstream leaders to label the group as naive and worse. What sets IfNotNow apart is its focus on disruptive protest. While some Jewish groups have long preferred quiet dialogue with the powerful over vocal demonstrations, IfNotNow believes that sitting and reasoning with American Jewish leaders won’t get them anywhere. Many Jewish groups, including the ADL, the American Israel Public Affairs Committee and the American Jewish Committee, endorse a two-state solution. Some vocally criticize Israeli actions and explicitly support Palestinian rights, like the dovish J Street. But IfNotNow accuses the mainstream of empty rhetoric in place of meaningful action. But the brash language encouraged by IfNotNow has meant trouble for at least one of its organizers. Simone Zimmerman, one of the group’s activists in 2014, was briefly appointed as director of Jewish outreach for Sen. Bernie Sanders’ Democratic presidential campaign, only to be suspended after it emerged that she had used expletives in a Facebook post about Israeli Prime Minister Benjamin Netanyahu. If the group’s goal is to consternate large Jewish groups, it is succeeding. Left-wing organizations are friendlier. T’ruah, the rabbinic human rights group, participated in the ZOA protest, and its executive director, Rabbi Jill Jacobs, noted a long history of young Jews staging protests of large Jewish institutions. In a statement, J Street said it shares IfNotNow’s concerns about the occupation and Trump. IfNotNow isn’t the only anti-occupation Jewish group that has shifted to protesting Trump. J Street has released statements criticizing the president-elect’s domestic policies and appointees. And Jewish Voice for Peace, which supports BDS, has also placed a new emphasis on protesting his statements and policies targeting minorities. IfNotNow activists say the fights against the occupation and Jewish communal acceptance of Trump are one and the same. But beyond any particular issue, some say the group has become a young, left-wing Jewish community for them. In their mission to make the establishment Jewish community uncomfortable, they’ve become comfortable with one another.